When I launched Tweet Marker Plus, I documented that it would store “about a month” of tweets. I didn’t want to promise too much before I fully understood the storage requirements. After a few weeks, I officially bumped it up to “at least 2 months”. I also added a full archive of your own tweets, which are never deleted. The truth is I’ve yet to write the code that actually deletes any tweets from the database and search index. Eventually I’ll have to, but not yet. So I’ll continue to evolve the service in a way that makes it more useful and sustainable. Recently I increased the $2/month price to $5/month, with the search index expanded to 3 months of tweets. Today I’m officially bumping the storage again, to 6 months of tweets. I’ve also changed to monthly billing instead of once every 3 months. Everyone who already has the $2/month plan will get to keep it. No price increase for you, and you still get the new 6-month storage and new features, as a thank-you for being an early subscriber. And I’ve added a major new feature. 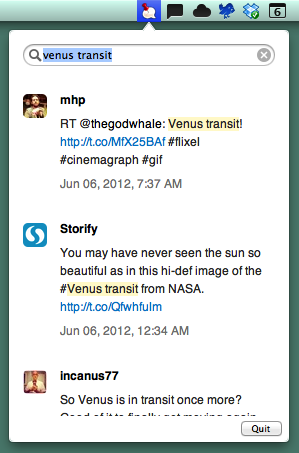 You can now create custom collections of tweets and publish them to share with others. This is a feature from my iOS app Tweet Library, and in fact any published collection from Tweet Library will also show up in Tweet Marker Plus. New in Tweet Marker, you have the option of keeping a collection private or making it linkable, without it showing up when someone browses the list of collections. The screenshots linked on the account page include an example of how collections work. As a bonus for Mac users, there’s also a new menubar search app. This little Mac app hides in the menubar and gives quick access to searching your Tweet Marker Plus timeline and archive. Here’s a screenshot of what version 1.0 looks like. This entry was posted in Business and tagged collections, menubar, pricing, tweetmarker, twitter, web on 2012/07/07 by manton.